When your patio requires a makeover, one of the many decisions that you will make is choosing which materials to use for your patio hardscape. If you already do not have a poured concrete pad that serves as your patio, your options are endless. There is even an option if you already have a concrete pad present. Below, we will cover some of the many paver patio options that you can install on your landscape. With each choice comes various pros and cons that you should consider during your redesign. 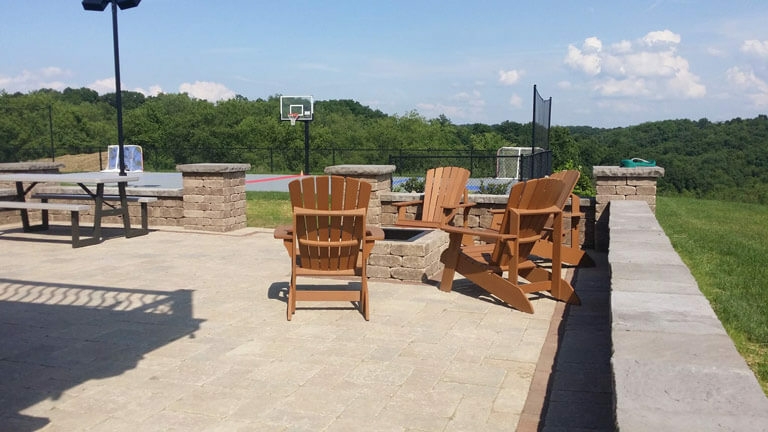 Additionally, landscaping in Pittsburgh enjoys a variable climate that serves well for choosing from the many options of pavers for your redesign. Some favorites among Pittsburgh landscapers include brick, concrete, rubber tile, and natural stone. Brick pavers provide you the incredible opportunity to customize your landscape to fit your style. Bricks can be re-used and weathered, providing a historical look. You can customize the layout by the pattern the bricks are laid. Additional customization can be achieved through the many different colors that bricks come in. Perhaps most important, bricks can be used on a relatively inexpensive budget. You may even be able to find them for free and just be responsible for hauling them. 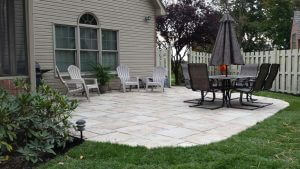 Concrete pavers are created from molded concrete and provide quick work to creating a patio. They can be formed to replicate stone, brick, or concrete. They can be interlocking or laid like floor tile, spaced how you see fit. A big benefit of using this type of paver is that they are less likely to crack under the stress of the elements, unlike poured concrete. They also help control water runoff when spaced and they alleviate any concerns with traction. Stylistically, your Pittsburgh landscaping company will be able to provide you with the color, size, shape, and texture of your choice. It is also important to note that patio pavers will be much more affordable than stone. A newer option is rubber pavers which are slip-resistant and made of 100% recycled materials. This eco-friendly option will provide underfoot comfort for your residential patio. These pavers are a bit limited in color options—generally black, red, blue, gray, and green. They can be installed directly on top of old concrete and will breathe new life into your patio. Easy to maintain with basic cleaning by using a vacuum, broom, or a spray down with a garden hose. These pavers come in a flat top style or are made to look like brick. They are extremely durable and will provide a long-lasting finish. They are not the most inexpensive option but the positives make them worth the price. Natural stone pavers are elegant and can turn your outdoor living space into a thing of beauty. Whether you choose travertine, marble, limestone, sandstone, or slate, your guests will know you take your outdoor living seriously. Although they have a higher price tag, you will get what you pay for in this case. All your choices will be customized and cut to your needs, though many sizes are already available. You will be able to handpick your stone and its color. The stones are extremely durable, are weather resistant, impervious to de-icing salt, and withstand severe freeze-thaw cycles. For a luxurious and sophisticated style, you will thoroughly enjoy your re-styled patio if you use natural stone. The possibilities are endless when redesigning your patio with pavers. As a premier Pittsburgh landscaping company, the experts at Treesdale Landscape Company will be able to provide you with any option you desire. Regardless of the paver option you choose, The Treesdale Landscape Company will be able to assist you in hand picking your hardscape materials and helping you redesign your patio to fit your taste and needs. Contact us today to learn more about our paver patio options.